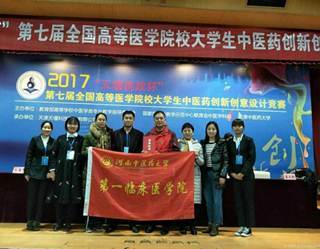 On Nov. 17 and 18, 2017, the final “ Tianyan Cup ” Competition of the 7thNational Chinese Medicine Innovative Design of Medical College Students was held in Tianjin University of Traditional Chinese Medicine, also the host, and “ Gas Therapy Machine of Temperature-Controlling Ultrasonic Atomization of Chinese Medicine ” , created by Huang Nana, Li Chang, Li Zhipiao, and Cao Junwen from the Specialty of Clinical Chinese Medicine Integrated with Western Medicine under the teachers ’ direction of Zhang Bin, Chen Zhanke, and Liu Guangchao from the first Clinical Medical School of HUCM, was awarded the top prize in the production category due to its innovation, practicality, and applicability approved by the judges, which has finally ended the record of no top prizes in this competition for HUCM. The competition, with its works including four categories, namely two dimensions, three dimensions, new media, and production, aims to foster for college students a scientific attitude of pursuing studies, an innovation spirit, and an ability of multi-disciplinary blending of knowledge, offering a platform for them to exchange and demonstrate their abilities. To get prepared for this competition, we organized our Innovative Design Competition of HUCM, and six representative works were chosen to attend the final. After the preliminary online assessment of experts, “Gas Therapy Machine of Temperature-Controlling Ultrasonic Atomization of Chinese Medicine” of HUCM eventually came out to the final from the 344 pieces of works all over the country. At the closing ceremony, Huang Nana, as a representative of all the contestants, shared her feelings with the audience.